The Allavino FlexCount Series VSWR30-2SSRN Dual-Zone Wine Refrigerator can store up to 30 of your favorite wine bottles in a 15" wide cabinet that is perfect for replacing old trash compactors. It's beautiful stainless steel framed glass door is tinted to keep harmful light out while showcasing your wine in style. The front venting design allows the unit to be built-in to cabinetry but the finished sides and top make this compact wine cellar attractive for freestanding environments as well. 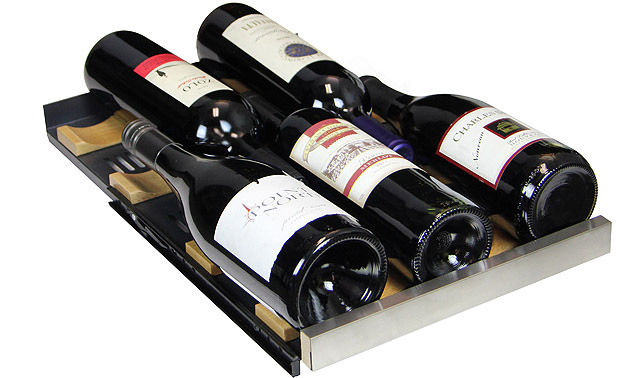 With it's dual-zone functionality, you are not limited to only storing red or white wine - now, you can do both at the same time! The VSWR30-2SSRN boasts extra-durable metal shelves with wood slats and stainless fronts that easily glide out on roller assemblies allowing you to quickly access your entire collection.